2. NATO post-Lisbon: Where to on nukes? 8. Scotland as a single-state nuclear weapons-free zone? 9. 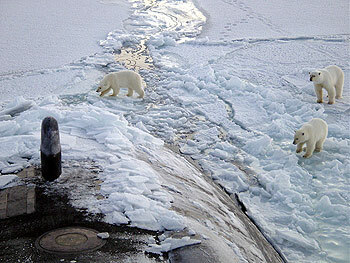 Nukes, climate change and the Arctic – new Cold War or a NWFZ? On 22 December President Barack Obama succeeded in moving the US Senate to ratify the new START Treaty negotiated with Russia and signed by Obama and Russian President Dimitry Medvedev in Prague on 8 April 2010 (see Bipartisan Security Group Welcomes Senate Ratification of START). Senate ratification had been in doubt due to resistance by Republicans, some of whose votes were necessary to obtain the 2/3 majority required (see Leading Republican Senators Voice Opposition to START Treaty, Voice of America, 19 December). However, enough Republicans were persuaded to support by arguments that START would enhance US capacity to monitor and limit Russian nuclear capabilities, would not restrict US Ballistic Missile Defences, and would assist in nuclear non-proliferation efforts. (See America needs a New Start, by PNND Co-President Ed Markey). The new START treaty is rather modest in terms of actual reductions in US and Russian nuclear stockpiles, but provides for a resumption of mutual monitoring of US-Russian nuclear forces, and opens the door to further nuclear US/Russian negotiations, and possibly to even start negotiations with other nuclear-weapon-states (see It’s just the START – next steps for the US in PNND Update 28, and START-ing a new Security by Rhianna Tyson Kreger, Huffington Post, 23 December 2010). 2. NATO post-Lisbon: Where to on nukes? The Summit failed to adopt a number of proposals from the European Leadership Network - a group of senior political, military and diplomatic figures including some PNND members - to lower the role of nuclear weapons in NATO doctrine and ‘make disarmament a core element of its approach to providing security.’ However, the Summit did agree to proposals for a comprehensive review of deterrence and to ‘creating the conditions for a world without nuclear weapons.' (See NATO Revises Nuclear Policy, Arms Control Today, December 2010). Countdown to Zero, a powerful documentary produced by the same people who brought us An Inconvenient Truth, was launched in United States theatres in July. The movie traces the history of the atomic bomb from its origins to the present state of global affairs, with the world held in a delicate nuclear balance that could be shattered by an act of terrorism, failed diplomacy, or a simple accident. The film features an array of international statesmen, including Jimmy Carter, Mikhail Gorbachev, Pervez Musharraf and Tony Blair. The movie has not yet opened in other countries. However, on 20 October PNND Japan hosted a pre-release screening of the Japanese version of Countdown to Zero in the new Parliament theatre. The screening was opened by Foreign Minister Seiji Maehara. On 26 February 2010, UN Secretary-General Ban Ki-moon sent a letter to the Speakers of all parliaments noting the importance of the nuclear Non-Proliferation Treaty Review Conference, highlighting the important role of parliaments and parliamentarians in advancing nuclear disarmament, informing them of his Five-Point Plan for Nuclear Disarmament and commending PNND and the Inter Parliamentary Union for their efforts in engaging parliamentarians in these issues. This was a unique action, the first time a UNSG has gone directly to parliaments on a key global issue. Over 25 Speakers/Presidents of Parliaments have replied to the UNSG, including those from Austria, Bolivia, Canada, France, Hungary, Ireland, Japan, Mexico, Monaco, Netherlands, New Zealand, Oman, Portugal, Russia, Spain, Syria, the United Kingdom and the United States. New Zealand speaker Lockwood Smith, reported that the House of Representatives had adopted a resolution acknowledging US President Obama’s leadership, highlighting New Zealand’s nuclear-free legislation, supporting the UNSG’s five-point plan and in particular preparations for a nuclear weapons convention. Neol Kinsella (Speaker of the Canadian Senate) and Peter Milliken (Speaker of the Canadian House of Commons), in their joint letter, commended the UNSG for his initiative, emphasized the key role that parliamentarians and parliaments have in advancing nuclear disarmament and commending the role of the Inter-Parliamentary Union for which nuclear disarmament is a ‘permanent concern’. 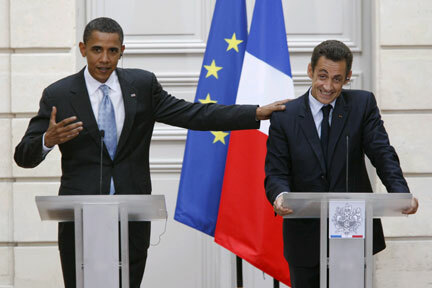 On 22 December, Le Monde reported that US cables leaked by Wikileaks confirm that although French President Nicolas Sarkozy publicly claims leadership in nuclear disarmament and non-proliferation, behind the scenes his government vociferously opposes US President Obama’s vision for a nuclear weapons free world and any concrete steps to achieve this (Les divergences entre Nicolas Sarkozy et Barack Obama à propos d'un "monde sans armes nucléaires). Le Monde argues the French have been actively lobbying US officials, including Rep. Ellen Tauscher the Under-Secretary of State for Arms Control and International Security Affairs, and have succeeded in moving the US to compromise from President Obama’s original rhetoric advocating a nuclear-weapons-free world to now advancing merely the objective to ‘create the conditions’ for such a world. This precludes the possibility of achieving nuclear disarmament until such conditions are met. The French succeeded in the adoption of such conditional language, for example, at the 2009 G8 Summit and in UN Security Council Resolution 1887. According to Le Monde, losing its nuclear weapons would be perceived in France as a "social regression", and that there exists "a French anxiety at the idea of being deprived of a symbol of power if nuclear weapons were eliminated". The leaks indicate France’s opposition to even small steps such as progress on tactical nuclear weapons in Europe. “…withdrawal of tactical nuclear weapons located in Western Europe, would be experienced as the worst scenario” as Russia would then be ready to start negotiating cuts in the ‘aerial deterrent’, which would put pressure on France to join negotiations on nuclear reductions. The leaks confirm a report by Ben Cramer in Le Monde on June 5 (La France face à l'option zero) that French officials and pro-deterrence academics are rallying behind the legitimacy of France’s nuclear doctrine in opposition to increasing publicity given to the ‘zero option,’ and the possibility that progress could possibly be made on the removal of US tactical nuclear weapons in Europe. In order to block such progress, France (and other pro-deterrence NATO governments) succeeded in convincing nuclear-hosting countries (Belgium, Germany, Italy, Netherlands and Turkey) that any further decisions on removing such weapons should be made by NATO (which requires consensus) rather than by the individual countries in conjunction with the US, as happened when Greece and UK removed the US tactical weapons from their territories. In May, France offered to host a meeting of the P5 (China, France, Russia, UK and US) in early 2011 to discuss implementation of the nuclear disarmament measures agreed at the Review Conference. The Wikileaks cables raise the question as to whether France will demonstrate good faith commitment at the P5 meeting, or whether the meeting will be used as a smokescreen while nuclear policies and practices continue as usual. At its inaugural meeting in Portcullis House on 3 November, PNND UK announced the appointment of Rob van Riet, a public international law expert, to be the PNND UK Coordinator, a part-time position made possible through support from the Poldham Puckham Charitable Foundation. Rob also works as the Coordinator of the World Future Council Disarmament Programme. PNND, with its international membership and global initiatives, aims to complement and collaborate with UK-based parliamentary groups working on nuclear disarmament issues including the All Party Group on Global Security and Non-proliferation co-chaired by Tony Lloyd MP and Lord David Hannay of Chiswick, and the Top Level Group of UK Parliamentarians for Multilateral Nuclear Disarmament and Non-proliferation convened by Lord Des Browne of Ladyton (former Secretary of State for Defense), and the Parliamentary Group of Campaign for Nuclear Disarmament chaired by Jeremy Corbyn MP. PNND UK’s first action was to meet in the French Senate on 4 November with French legislators and aides to discuss UK-French parliamentary collaboration on common security and nuclear disarmament (See PNND launches France-UK collaboration). Recent outreach by Mr van Riet to selected UK parliamentarians, with the help of PNND Co-president Baroness Sue Miller of Chilthorne Domer and the Institute for Law, Accountability and Peace (INLAP), has resulted in a number of new members including Lord David Hannay (Cross-bench, President of the UK United Nations Association), Lord Geoffrey Howe of Aberavon (Conservative, former Foreign Secretary and Deputy Prime Minister, and a leading member of the Top Level Group), Peter Bottomley MP (Conservative, Member of the Council of Europe), Caroline Lucas MP (Green, former MEP and Co-President of the European Parliament Inter-Group on Peace Initiatives), Andrew George MP (Liberal Democrat, former Secretary of State for International Development), Roger Godsiff MP (Labour, former Member of the Inter Parliamentary Union Executive) and Barry Sheerman MP (Labour/Co-operative, Chair Cross-Party Advisory Group to Chancellor of the Exchequer on European Economic Reform). See PNND UK Members for full list. Meanwhile, PNND Global Council Member Jeremy Corbyn MP has been active in the House of Commons, raising questions to Secretary of Defense Liam Fox about the cost to taxpayers of the Trident (UK nuclear weapons) system, and gathering additional signatories for his Early Day Motion 498 calling on the UK government to support negotiations for a Nuclear Weapons Convention. New endorsers include Peter Bottomley (Conservative), Julian Huppert (Liberal Democrat), Elfyn Llwyd (Plaid Cymru), Caroline Lucas (Green) and Angus Robertson (Scottish National Party). In mid-October, a number of parliamentarians from NATO countries and other allies of the United States, prompted by a letter from the International Association of Lawyers Against Nuclear Arms (IALANA), asked parliamentary questions on their government’s intended vote on a draft United Nations resolution calling for negotiations leading to a nuclear weapons convention. The resolution was similar to one adopted by the UN in previous years to follow-up on the 1996 International Court of Justice (ICJ) Advisory Opinion which affirmed a universal obligation to negotiate for complete nuclear disarmament. This year, the resolution was revised to take into account key consensus agreements of the 2010 NPT Review Conference (See UN First Committee Monitor Momentum toward a nuclear weapons convention or framework of agreements). Following parliamentary questions and receipt of the IALANA letter, whose signatories included former Vice-President of the ICJ Judge Weeramantry, a number of countries changed their vote either from opposition to abstention (e.g. Norway and Iceland) or from abstention to support (e.g. Kazakhstan and Tajikistan). Iceland parliamentarian Birgitta Jonsdottir noted that the information from IALANA was very helpful and influential in Iceland’s decision to abstain. The final vote on the UN resolution was 133 in favour, 28 opposing and 23 abstaining. 8. Scotland as a single-state nuclear weapon-free zone? On December 9th the Scottish Parliament debated Motion S3M-7072 on Scotland’s Nuclear Weapon Free Zones, put forward by PNND Council Member Bill Kidd MSP, and supported by 18 other parliamentarians. The motion proposed that the Scottish Parliament should explore the possibilities of establishing Nuclear Weapon-Free Zones in Scotland “in homes, classrooms, places of work, communities, local authorities and in the environs of the Scottish Parliament in Edinburgh, with the aim to register Scotland as a single-state nuclear weapons-free zone with the United Nations.” Kidd highlighted the experience of New Zealand where a mass movement declaring nuclear-weapon-free-zones in homes, schools, churches, workplaces and local authorities in the 1980s led to the entire country being established as nuclear-weapons-free by legislation. 9. Nukes, climate change and the Arctic – new Cold War or a NWFZ? Stavridis made his views known in a foreword to a Whitehall paper, entitled Environmental security in the Arctic Ocean: promoting co-operation and preventing conflict, written by Prof Paul Berkman, head of the Arctic Ocean geopolitics programme at the University of Cambridge. Berkman notes that "Strategic long-range ballistic missiles or other such military assets for national security purposes in the Arctic Ocean are no less dangerous today than they were during the cold war. In effect, the cold war never ended in the Arctic Ocean." PNND Special Representative Romeo Dallaire joined other Canadian arms control experts (Adele Buckley, Erika Simpson and Mike Wallace) in September calling for innovative co-operation to ensure a peaceful future in the Arctic including establishment of an Arctic Nuclear Weapon Free Zone. (See A nuclear-weapon-free zone in the Arctic, The Embassy, 15 September). PNND has collaborated with Pugwash Canada and Pugwash Denmark on a number of meetings and conferences to explore the possibilities of establishing such a zone. PNND aims to provide relevant documents and communications in key languages, in as much as our limited resources make possible. We are pleased to announce enhanced PNND websites in French, German, Japanese and Spanish which include many of our documents and updates. Roderich Kiesewetter MdB (CDU/CSU, Germany). Roderich Kiesewetter is Deputy-Chair of the Bundestag Sub-committee on Disarmament and Arms Control, leader of the German delegation to the Euro Mediterranean Parliamentary Assembly and member of the Parliamentarians’ Network on Conflict Prevention. Prior to entering parliament Mr Kiesewetter worked at the German defense ministry, EU Council and NATO headquarters where he was office manager of the chief of staff. Saber Chowdhury MP (Awami League, Bangladesh). Saber Chowdhury chairs the Bangladesh Parliament All Party Group on Climate Change and Environment, is Vice President of the Inter-Parliamentary Union's Standing Committee on Peace and International Security and is an active member of the Commonwealth Parliamentarian Association. He has introduced legislation on prohibition of Torture and Custodial/ Extra-judicial killings in Bangladesh, rights of slum dwellers, a code of conduct/ethics for members of parliament, and repeal of Leprosy Act which had promoted segregation. He has introduced resolutions on nuclear disarmament and jointly authored an inquiry of the Bangladesh and UK Parliaments on Climate Change Equity. Hideo Hiraoka MP (DPJ, Japan). Hideo Hiraoka is serving his fifth term as a member of the Japanese House of Representatives. He is the Vice-Minister of Internal Affairs and Communications and a senior advisor and the former Secretary General of the DPJ Parliamentary Group on Nuclear Disarmament and a member of the House Committee on Internal Affairs and Communications. He has led a number of nuclear disarmament initiatives including a joint Japanese/South Korean parliamentary declaration supporting a Northeast Asian nuclear-weapon-free-zone and a cross-party letter from 204 Japanese parliamentarians to US President Obama during the US Nuclear Posture Review supporting Obama’s vision for a nuclear-weapons-free world and initial steps including lowering the role of nuclear weapons in security doctrines.